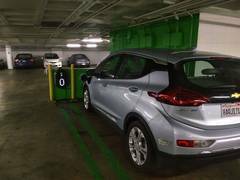 In my first extended trip in our 2017 Chevy Bolt EV, I drove down to the Los Angeles Airport (LAX) Marriott for a conference, a one-way distance of 120 miles. Unlike my previous experience driving to LAX in an electric vehicle (EV), I don't have much to report. The Bolt worked as designed and I had ample charge and could stay with traffic. We have come far from the days of the Nissan Leaf. 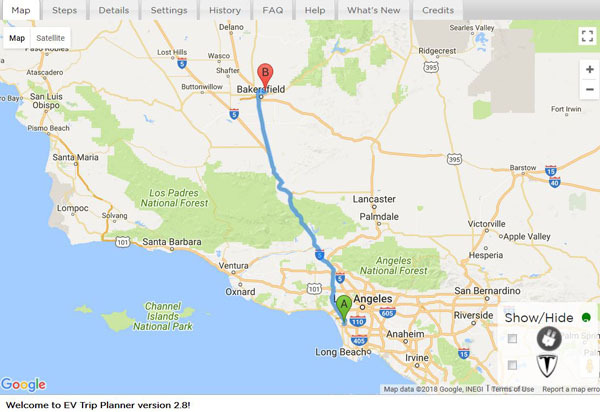 See my earlier reports at Star-Crossed Trip: Bakersfield to LAX & Return, and Stats on a Star-Crossed Trip: Bakersfield to LAX & Return. Unlike the Leaf, I didn't need to stop en route. Nor did I need to nurse the Leaf up the Tejon Pass in the truck lane. On the other hand, there's nothing exciting about such a venture. The Bolt performed just like any other car, gas or diesel. It simply did its job and I didn't have to worry about whether I'd make it to the Level 2 chargers at the hotel. As before, I made a spreadsheet of energy consumption estimates from EV Trip Planner and a tabular estimator based on the work done by Tony Williams, an early pioneer in the Leaf. EV Trip Planner doesn't have a drop down for the Bolt. It does have two entries for the Leaf. I chose the Leaf beta version based on an earlier trip from Bakersfield in the Bolt. Being new to the Bolt I wanted to err on the conservative side. So I upped the passenger weight for the Bolt to 500 pounds to compensate for the 250 pounds greater curb weight for the Bolt relative to the Leaf. Because it's supposed to be winter here I dropped the outside temperature to 55 F.
With these entries, EV Trip Planner said I should consume 35 kWh on the way to LAX and 36 kWh on the return. The tabulator using Tony Williams' data came in at about the same amount driving at 60 mph. As noted, I kept up with traffic but I held my speed to the speed limit. I opted to stay out of the diamond lane and drive conservatively across LA. It felt odd to crest the Tejon Pass without pulling over at the Flying J truck stop to charge with the portable charge cable or stop at the low-power CHAdeMO fast charger at Gorman. I just passed them by. I arrived at the hotel after consuming only 27 kWh at a rate of 4.5 miles/kWh. I did far better than either estimator suggested. For the return trip I reset EV Trip Planner to the default settings for the Leaf beta version. 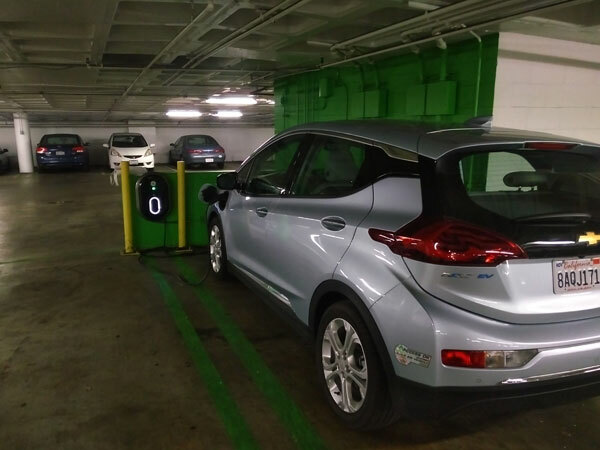 The LAX Marriott has two J1772 GE Watt Stations and two Tesla destination chargers in the parking garage. There was a space open so the valet let me in and I began charging. I noted on PlugShare that the charge would be completed by 10.30 pm. 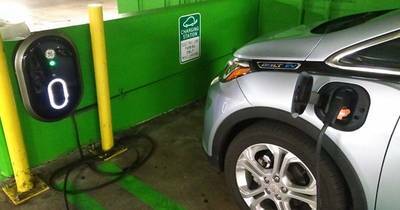 The next morning, the Chevy app noted that the car was charged, but unplugged. When I went to move the car to a non-charging parking space, I saw that there was a Volt charging, a Prius waiting to charge, and another Bolt in the queue for the charger I had been using. 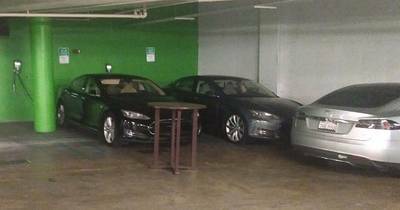 There were two Teslas charging and one Tesla waiting. These were busy chargers. On the return trip I threw conservation to the wind and got into the diamond lane as soon as I could and never looked back. The difference in driving style is reflected in the reduced mileage of 3.9 miles per kWh on the trip back. I added about seven miles more on the homeward-bound leg to drop off a colleague. That would add almost two kWh to the consumption tally. Even after using the default settings in EV Trip Planner, the overall consumption was about 7% less than estimated for the entire trip. That's the way I like it to be. Next up is a 150-mile trip to the coast. This is a scenic direct route to the coast, something that simply wasn't possible in the Leaf. I am looking forward to it.